Tired of watered down drinks? Or running out of ice? With our drinkware, the ice stays frozen for a long, long time. You’ll finish your drink before the ice melts! 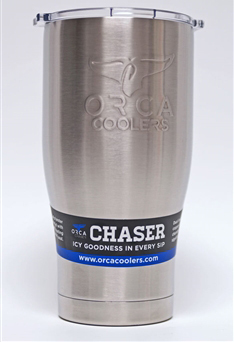 ORCA products keep the drinks hot, too. Nothing like reaching for your coffee on a cold winter morning and finding that it’s still piping hot. Not all stainless-steel products are the same. ORCA’s double-walled, copper clad and vacuum sealed products are made of 18/8 stainless-steel to provide the best possible cold and heat retention. Products with lids feature rugged Eastman Tritan™ copolymer, keeping you leak and shatter free as you’re on the go.